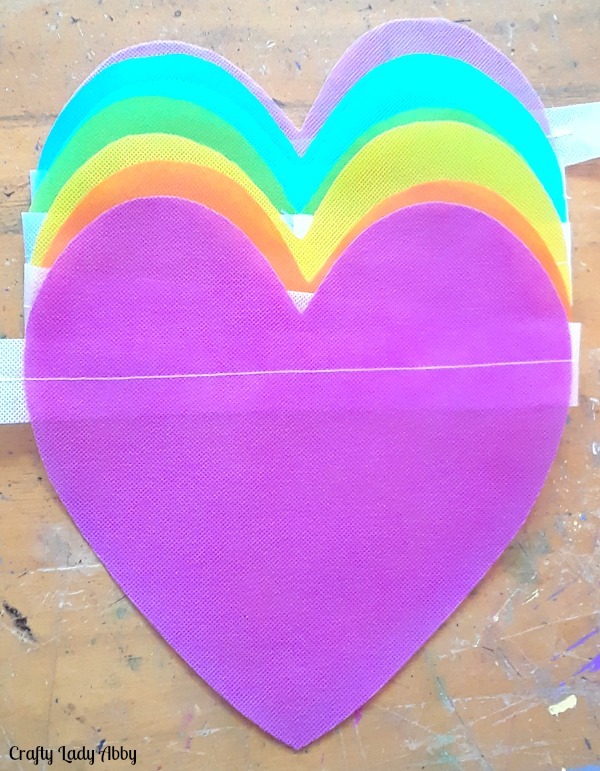 The rainbow heart banner uses Fairfield World OlyFun. This colorful garland is inspired by the Sweetheart Valentine's Day candy. Instead of the traditional lettering found on the classic treat, I used a phrase that has personal meaning and beautiful cursive. Those touches make this home decor item more personalized. I hung it above our door to remind my husband how much I love him every day, and not just at Valentine's Day. Our phrase, "Love you forever and always" is something we'd tell each other early in our 15.5 year relationship. I had "Forever and Always" engraved on his wedding ring before we were married. Though this has deep meaning for my family, you can choose any short phrase you would like to. Fairfield World provided me with their products for this project. They paid me to create this project and tutorial. All thoughts, opinions, instructions, and photos are my own. I use Amazon Affiliate and Share-A-Sale links. Any purchases made using these links results in my being paid a small commision from these companies. It does not affect your purchase cost. 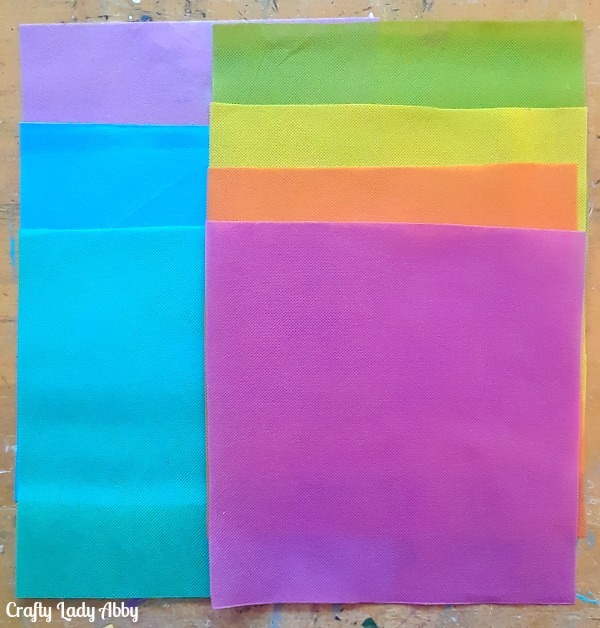 1) Cut one square from each OlyFun color, for total of 7. Squares should be even in size. 2) Fold one square in half. Using a pencil, Draw half of a heart as big as you can. 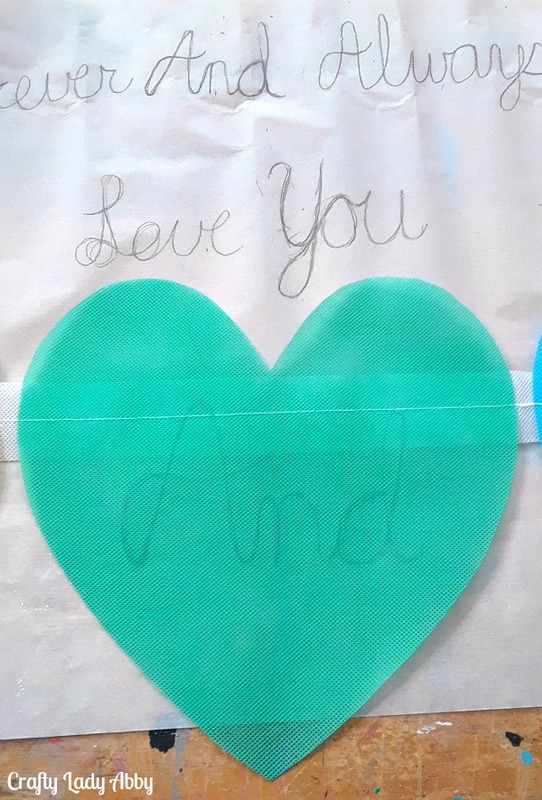 If you feel uncomfortable doing this on the OlyFun fabric, draw a heart on paper for a reusable pattern. Keeping the square folded, cut along the heart line. Open the OlyFun to reveal a heart. Trim the shape if needed. 3) Stack the three squares together. Center the cut heart on the top of the stack. 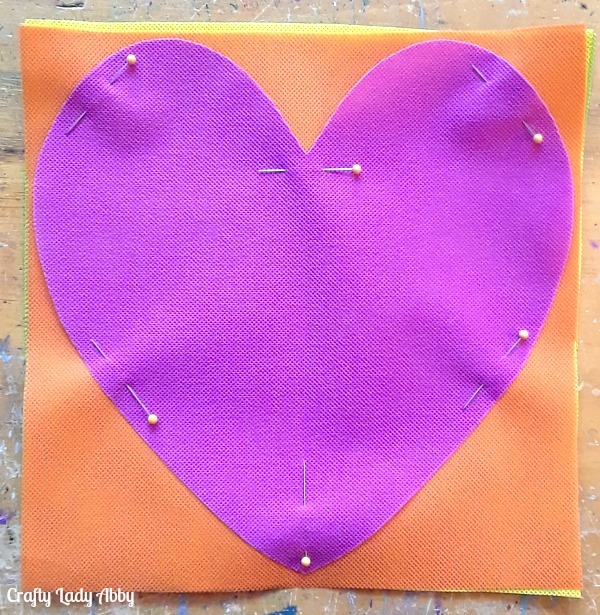 Use straight pins to lightly secure the heart through the layers. Carefully cut around the heart, creating 3 more hearts. Unpin the top heart. Repeat for the other three squares. 4) Cut two long strips of Snow White OlyFun, 2" wide by the bolt width. Load the sewing machine with white thread. Lay two ends of the strips together. Stitch the ends together, 1/2" from the edge. Open up the strips, finger pressing the seam to one side. Sew 1/4" from the seam. Trim away excess thread. 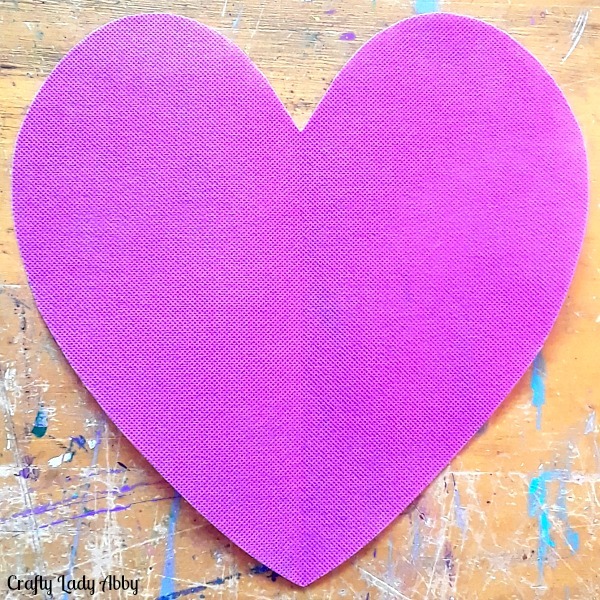 5) Line up the hearts in color order along the connected strips, spacing the hearts about 1" away from each other. Use straight pins to secure the hearts to the strip. At the sewing machine, sew down the center of the strip, attaching all of the hearts to the strip. Trim away excess thread. 6) Lay out a big piece of parchment paper. With a pencil, write out the words in cursive on the parchment paper. This is how I practiced my cursive before committing to a lettering style for each word. I used my phone to look up cursive lettering, so I could figure out how to blend the uppercase and lowercase letters. Carefully write each word in cursive on the hearts. I left the 1st and last heart blank. 7) Pour a little white fabric paint onto the paper plate. Using a small flat brush, carefully paint over the cursive lines. Adjust the letter shape if needed as you paint. Let each heart dry before moving it. If you feel like the paint isn't opaque in one coat, paint a 2nd coat after the 1st is dry. Rinse the paintbrush in the cup of water. Dry off the paintbrush with the paper towel. 8) Try to center the banner wherever you are hanging it. I didn't have a spotter on hand, as she was in school, so mine is slightly off center. Use a hammer and white upholstery nails to hang up the banner. I didn't want my banner to drape, so I added a nail every other heart, on the white strip. I tied bows with the slack of the white strip. I used candy colored OlyFun for this project. OlyFun comes in 19 colors and 4 metallics, lending itself to a multitude of color combos to fit any decor. 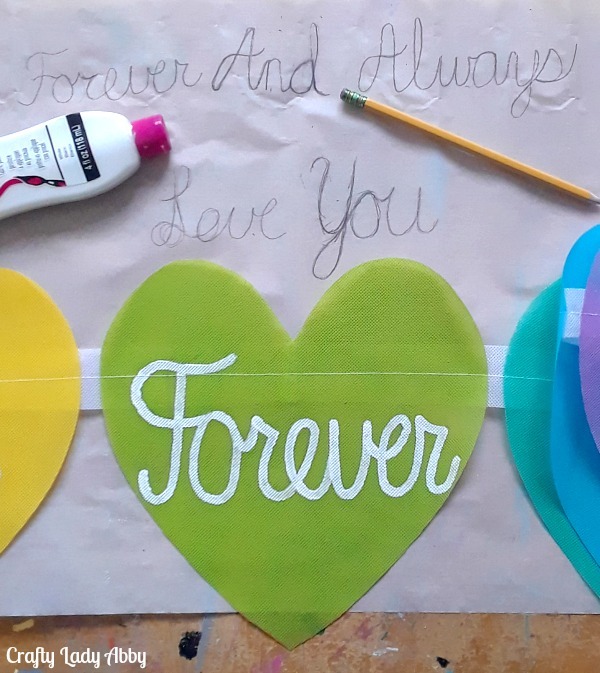 I customized this banner for Valentines Day, but OlyFun cuts like paper and can be cut into any design. For a non-sew project, use low temperature hot glue. I find sewing to be cleaner, but understand that it might not be an option for everyone. Whatever you are making, have fun with it. Happy Makery!